On 12 February, Macedonia’s name was officially changed to the Republic of North Macedonia. 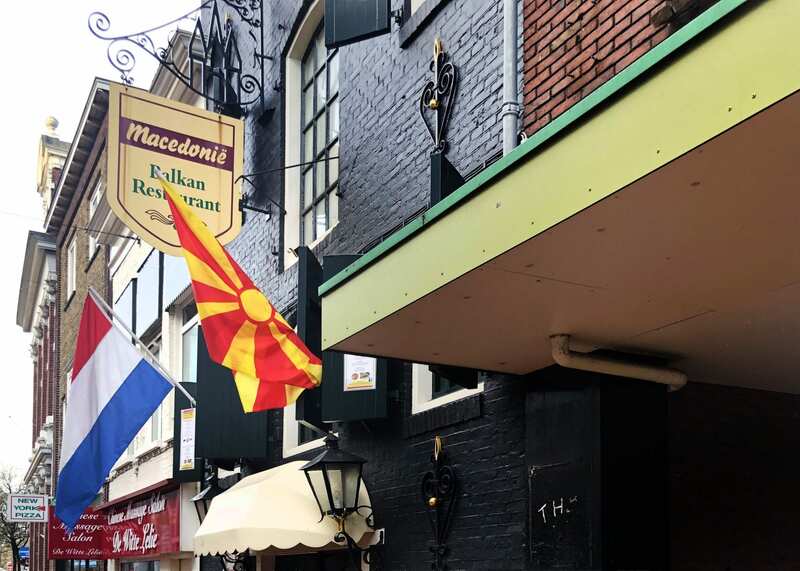 Even though Groningen may seem far removed from Balkan politics, the Macedonian community in the north still has strong feelings about what they see as a politically-motivated move. Bobi Mizeski (60) stirs his coffee in the Balkan Restaurant Macedonie, located in the heart of Groningen. Mizeski’s establishment used to be frequented by Nikola Dimitrov, Macedonia’s current Foreign Minister. But the former ambassador to the Netherlands doesn’t come anymore. “I stopped speaking to him. He’s a traitor”, explains Mizeski, referring to the momentous vote of the small Balkan state’s MPs to change their country´s name to the Republic of North Macedonia earlier this year. The step was taken after a 27-year-long spat over the name Macedonia between Skopje and Athens. Greece had been vetoing its northern neighbour’s membership in NATO and the EU, arguing the name Macedonia culturally and territorially infringed on its northern province, also called Macedonia. Although Greece’s MPs eventually backed the agreement between the two countries by a slight majority of 153 to 146 votes, the historic decision was overshadowed by growing political turmoil. Violent clashes between the police and thousands of protesters ensued, with 72 percent of the public disapproving of the measure. Just across the border, the situation appears to be similar. Mizeski and many of his compatriots resent the name change, even though it was widely welcomed by the international community for opening the state’s path to joining NATO and, potentially, the European Union. As NATO’s enlargement policy is in many ways less strict than that of the EU, its members already signed an agreement with Macedonia in early February, paving the way for Skopje to become the 30th capital in the military alliance. “It’s a logical step for the West Balkan state that has been surrounded by NATO members for years,” explains European security specialist Ine Megens of the University of Groningen. With a population of merely 2 million and a very modest defence budget, Macedonia hold little military importance. However, having more presence and oversight in the region is arguably NATO’s largest benefit from Macedonia’s prospective membership. “The alliance wants to incorporate the countries of the Western Balkans to secure its own borders and neighbours,” Megens adds. But the timing of the decision is also rather “opportune”, says James Leigh, a lecturer in Euroculture at the University of Groningen. As both Macedonia and Greece currently have left-leaning PMs who do not ascribe to the “strong national identity lines of thoughts” that dominated previous governments, the time was ripe for such a deal to come through. The behind-the-scenes influence of other state actors may also have been an important factor, Leigh thinks. Still, the road to victory was far from smooth for Prime Minister Zoran Zaev. His effort to secure a mandatory two-thirds majority, or 80 of the parliament’s 120 members, to ratify the deal he struck back in June last year with Greek PM Alexis Tsipras, was marred by allegations of bribery, corruption scandals and publicly aired political machinations. In the end, 81 lawmakers narrowly passed the constitutional amendment. But more than half of the Macedonian population boycotted an earlier referendum on the proposed name change. The plebiscite resulted in an overwhelming approval of the proposed measure, albeit on a slim 40 percent turnout. It is hard to read much into these numbers as election turnout tends to be generally low in the country, Leigh points out. People stopped believing in politics: “There’s a deeply embedded scepticism in the society stemming from years of inefficient and corrupt governments. A lot of Macedonians have lost trust in democracy and are hesitant to vote,” he explains. Yet it seems that prospects of any kind of societal and political reconciliation have diminished greatly as even the pro-European majority of society rejected the name change, suggests Senka Neuman-Stanivukovic, an expert on the region from the University of Groningen. “The change came at a big sacrifice,” she adds. “Our people are broken and sad,” exhales Mizeski, surrounded by remnants of his old life in the Balkans. He says he echoes the attitude of Groninge’s small community of a couple dozen Macedonians who are proud of their country´s name that dates back to Alexander the Great, the ancient conqueror and king of the region. “How would you feel if someone wanted to change your name, the name you fought for throughout history?” asks Mizeski. Although most citizens are resistant to the change, fear continues to grip Macedonian dissenters in light of the government’s alleged crack down on protesters who often face house arrest or threats from the police. “This is not a democracy. It’s a communist regime,” Mizeski says.